The majestic river passes through virgin forests that shelter and nourish rare flora and fauna. It also cuts across beautiful cities on its path to the Pacific. The Amur, the world’s tenth longest river flows thousands of kilometres from Mongolia through China and Russia until it empties itself into the Tatar Strait, which is connected to the Pacific Ocean. The Amur is to Russia what the Brahmaputra is to India, a river that flows through some of the country’s easternmost areas and is not as popular in folklore as its western cousins. Like the Brahmaputra, the Amur is strategically important, and since time immemorial, its basin has been inhabited by people with animistic beliefs. Long before the first brave Russian explorers travelled thousands of kilometres east of Lake Baikal towards the end of the Eurasian landmass, there lived an Asiatic people in this remote part of the world. The Nanai are the original inhabitants of the land by the majestic Amur. Like many in India, the Nanai believe that animals, plants, and inanimate objects possess a spiritual essence. For thousands of years, these people lived in complete harmony with nature, only taking the lives of other living beings to survive the harsh climate. One of Russia’s greatest explorers, Vladimir Arsenyev wrote in detail of the legends of the Amur River and the Nanai people in his books ‘Along the Ussury Land,’ and ‘Dersu Uzala,’ which was adapted into an Oscar-winning film by the legendary Akira Kurosawa. It’s the forests that surround the Amur that have some of the most diverse wildlife on the planet. The area is home to the Amur leopards and the real king of cats, the Amur (or Ussuri) tiger. 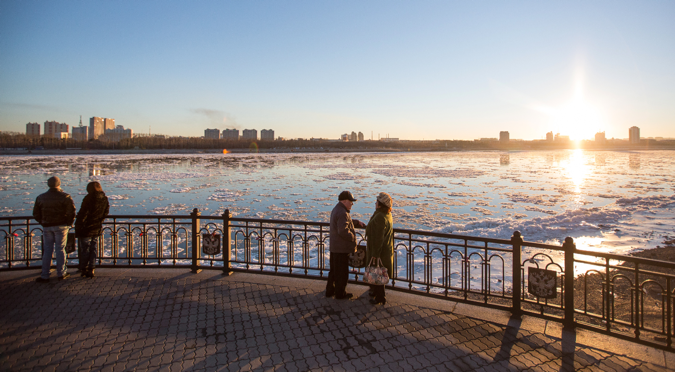 Despite most of the river basin having winters where temperatures regularly fall to -40 degrees Celsius, the Amur only flows through areas that enjoy four-season climate without permafrost. Each of the seasons has its distinct beauty, with the autumn being the most colourful. Those who want to get a glimpse of the world’s largest tigers have the best chance to do so in the winter when there is no chance for the majestic cats to camouflage themselves in the snow. The sparsely populated lands on the Russian side of the riverine border with China are some of the most fertile lands in Russia in the warm season. Temperatures rise to +40 Celsius in the summer with the humidity making it feel even hotter. Everything seems to come in a large size in the Amur basin from humongous mosquitoes to the Kaluga, a fish that actually grows to 18 feet! As the Amur flows through the Russian Far East on its journey to the Tatar Strait, it passes three unique and underrated cities: Blagoveshchensk, across the river from Chinese Heihe, Khabarovsk, which has an almost Mediterranean feel in the summers, and Komsomolsk-na-Amure, most well known in India for housing a large Sukhoi plant. In Blagoveshchensk, you can walk on a promenade with old Russian and Soviet buildings while looking across the river at large skyscrapers, which have essentially become symbols of modern China. There is little doubt about which of the cities has benefitted more from border trade. The centre of Khabarovsk has a classical European feel since its historical architecture traces its origins to the turn of the 19th to 20th centuries. Although some of the buildings were damaged during the Russian Civil War, the city was spared the mass destruction that was commonplace during the Second World War. Komsomolsk-na-Amure on the other hand was built as a secret location to host strategic installations including important arms factories. The city went through a phase of economic depression in the 1990s before it’s 1930s and 40s Stalinist architecture was restored. It feels more like a Soviet boomtown now. Summer is a great time to ride ferries north from Khabarovsk all the way to the small town of Nikolayevsk-na-Amure, which is the closest town to Amur Estuary and the Tatar Strait. However, it’s only in early winter, can one see one of the most beautiful natural sights in the region: the movement of ice floes on the Sea of Okhotsk. Nine years ago, I had the (mis)fortune of getting lost and spending a night alone in a deep forest by the river, close to the China border. I wasn’t eaten by a tiger, and lived to tell the tale. I realise how lucky I was to enjoy the beauty of that night, the cool autumn breeze, the September full moon, a sky full of stars and the mysterious and haunting sounds of the forest. For one night, I could see and feel what great explorers like Vladimir Arsenyev did over a century ago. Time has more or less stood still in this virgin forest. Of course, there are better ways to see and feel the place than getting lost there on an autumn evening! For nature lovers, few experiences on earth can come close to time spent in the forests by the Amur.